In the pantheon of brutal/technical death metal bands, Suffocation is without a doubt one of the premier acts. Now in their twenty-fifth year as a band, with seven full length albums and a couple EPs under their belt, Suffocation could very easily phone it in at this point and still achieve moderate success. Luckily for us, that’s just not their style. Pinnacle of Bedlam, the band’s follow-up to Blood Oath (2009), is a shining example of exactly that. Until now, Suffocation have typically employed a rougher sound on their records, perhaps as a last grasp toward the obsure and underground nature from when the band started back in ’88; perhaps more likely is simple coincidence (that’s where my money is). Even on the band’s last two records (Blood Oath and Suffocation) the edges were a little frayed, avoiding the surgically-precise sound that so many other modern death metal acts have made use of. With Pinnacle Of Bedlam, though, all of that is thrown out the window. 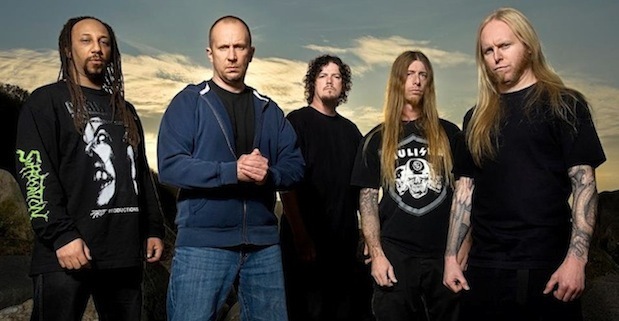 With Chris “Zeuss” Harris on mixing and mastering duty, Suffocation’s sound has evolved into a more dense, clearly focused attack. An interesting change of pace for Suffocation. If you forced me to compare it to the sound of another record, the closest comparison I could make is Neuraxis’ Asylon (2011). What has always set Suffocation apart from their cohorts, and continues to do so with Pinnacle Of Bedlam. is their distinct sense of pacing and songwriting throughout the flow of an album. For many bands of similar style, this is the aspect of the music that is often overlooked or poorly executed; Suffocation display complete and total mastery over it album adter album. Whether it’s through drum breaks, tempo-changing guitar solos, changing from aggressive blast beats to a more legato feel or any other number of techniques–Suffocation maintain a keen sense for the listener’s attention span. Finding ways to evolve and alter their sound organically and over time is what truly great, lasting bands always seem to have in common–we’re witnessing that with Suffocation as they release album after album. While Pinnacle of Bedlam might not be a completely new, exciting change of pace for Suffocation, I’ll galdly take a fresh take on the Suffocation I know and love. Fans of the band will certainly not be disappointed with this latest effort.